Q: According to reports, two Saudi sisters are in Hong Kong and they are currently seeking asylum. Their lawyer says they were taken from Hong Kong airport because their family doesn't want them to flee to Australia. Hong Kong is part of China and China is in charge of Hong Kong's diplomatic affairs. Can you tell us what communications the Chinese government has had with the Saudi government about this case? But unfortunately, I'm not aware of what you said. Q: It is reported that on February 23, the US will take all means to support the Venezuelan opposition in bringing the "humanitarian aid" into Venezuela. Some believe that it aims to trigger conflicts and lend a convenient excuse for military intervention. What is your comment? A: We have noted that for some time, the Venezuelan government has remained calm and restrained, done its best to maintain peace and stability within the country, and effectively avoided bloodshed and major conflicts. If the so-called "humanitarian aid" is forcibly brought into the country, violent confrontations may be triggered, which will lead to serious consequences. This is the last thing that any party want to see. China opposes military intervention and any attempts leading to tensions or even unrest in Venezuela. Q: Have you got any update on the situation of Australian coal exports waiting off the Chinese port? Is the Australian coal export being banned or restricted for any reason? A: I answered your question on this issue at yesterday's press conference. After that, I noted some Reuters reports saying that five harbors overseen by Dalian customs will impose an indefinite ban on Australian coal by not allowing it to clear through customs. Here I'd like to make a clarification that the relevant Reuters reports are not true. As far as I know, all ports of the Chinese customs allow the declaration of coal imported from Australia and other countries. In recent years, in risk monitoring and analysis on the quality and safety of imported coal, China has found that some imports did not meet our criteria for environmental protection. Accordingly, the Chinese customs strengthened their efforts in quality and safety inspection and evaluation on the environmental impacts of imported coal, which are compliant with relevant laws and regulations. By doing so, the legitimate rights and interests of Chinese importers and the environmental safety can be better protected. Follow-up: Can we clarify that there is no ban on Australian coal in the port of Dalian? A: Like I said, the relevant media reports are not true. All ports of the Chinese customs allow the declaration of coal imported from Australia and other countries per usual. Q: America is demanding that China reduce its oil imports from Iran. At the same time, Saudi Arabia has in the past offered to sell more to those countries which comply with such American demands to reduce oil imports from Iran to make up any shortfall that they may have in supply. Could you please tell me to what extent will China's oil purchases or imports from Iran be determined by such American demands and Saudi offers? A: First, China keeps normal energy cooperation with both Iran and Saudi Arabia. Second, China always opposes unilateral sanctions and "long-arm jurisdiction", and this position remains clear-cut. Third, China makes independent decisions on the direction and scale of energy cooperation with other countries in light of its own economic development needs. Q: The United Nations Security Council yesterday issued a press statement on the attack in India-controlled Kashmir, identifying Jaish-e-Mohammed as responsible for the attack. Does this mean that the Security Council now has evidence in hand to prove that JeM is the perpetrator of the attack? What are your comments? A: China has been closely following the development of this recent attack. In yesterday's Security Council press statement, a specific organization was mentioned, but it was a general statement rather than a judgment. 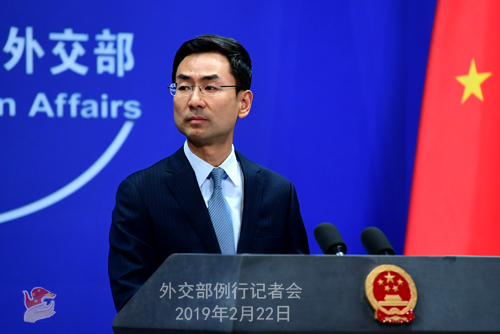 The Chinese side has noted that the Pakistani government expressed its will to coordinate with India in the investigation and seek to resolve differences through dialogue. Parties concerned should conduct objective and unbiased investigation to find out the truth. 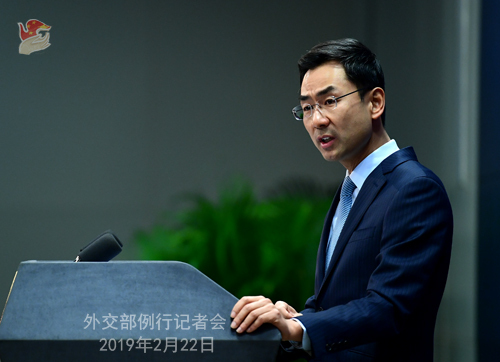 China hopes that India and Pakistan can exercise restraint, engage in dialogues and make joint efforts to preserve peace and stability of the region. Q: The British Chancellor of the Exchequer said yesterday that Britain's talk of sending a warship to the Pacific has not helped with relations with China. There has been persistent speculation in Britain that Chancellor Philip Hammond's visit to Beijing was canceled because the Chinese government was unhappy with the relevant comments by the British defense minister. This issue has been going on now for about two weeks. Does the Chinese government have a formal response to it yet? And can you confirm his visit wasn't canceled? A: China has responded many times to the remarks of the British Defense Minister Gavin Williamson, so I will not repeat it here. China values its bilateral relations with the UK and hopes that the UK can earnestly respect China's core interests and major concerns and work for a sound and stable bilateral relationship. As for your question on the British Chancellor of the Exchequer Philip Hammond's visit to China, we have expressed our welcome on multiple occasions. 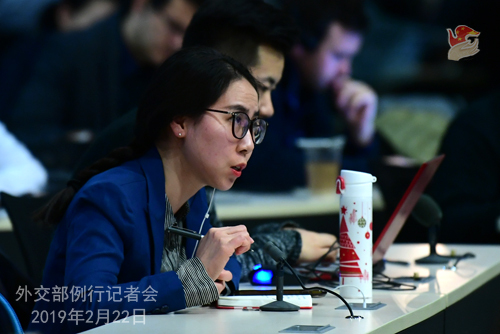 Q: Recently, certain foreign executives have showed varying degrees of concerns over their business activities in China, worrying that their safety might not be guaranteed. What's your response? A: The so-called safety concerns of certain individuals are simply baseless and unnecessary. The Chinese government protects the safety and legitimate rights and interests of foreign citizens in accordance with the law. As long as they abide by Chinese laws and regulations, their safety can be guaranteed. According to latest statistics from relevant Chinese authorities, the number of foreign-invested companies newly set up in China in 2018 topped 60,000, up by 69.8 percent. Paid-in foreign investment reached USD 135 billion and increased by 3 percent. These figures reflect a large scale of people-to-people exchange, including numerous trips to China by foreign businessmen for trade deals. Would those figures have been possible if China were not a safe place? I don't think so. I would like to stress that China follows an opening-up policy of mutual benefit and win-win outcomes. The remarkable progress China has made over the past four decades is partly owed to foreign enterprises and senior executives who participated in and offered advice to the reform and opening up. Just as Chinese leaders have pointed out on many occasions, our country's door will open only wider to the world. 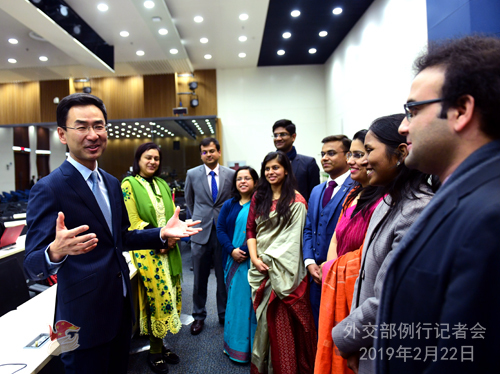 We will continue our efforts to foster a better business environment for foreign enterprises, and welcome foreign senior executives to visit China and do business here as always. Q: Do you have any information on Kim Jong Un passing through China this weekend by train on his way to Viet Nam? Q: To follow up with the Venezuela question, Bloomberg reported that officials from the Maduro Administration told a group of executives representing about 50 companies to open bank accounts in Russia, Turkey, China and India to begin relationship with suppliers in these mentioned countries. I wonder if you have any confirmation if Venezuelan companies made any request to China in this regard? A: I'm not aware of the specifics you asked about. What I can tell you is that the practical cooperation between China and Venezuela has been carried out following the principle of equality, mutual benefit, common development and commercial rules. It is compliant with the law and beneficial to our two peoples. China will continue to uphold this principle in its exchange and cooperation in various fields with Venezuela. Q: The Saudi Crown Prince is visiting China today. Has he met with President Xi? And can you tell us a little bit about his visit? A: According to my knowledge, President Xi Jinping will meet with Crown Prince Mohammed later this afternoon. The Chinese side will issue press releases in a timely manner. 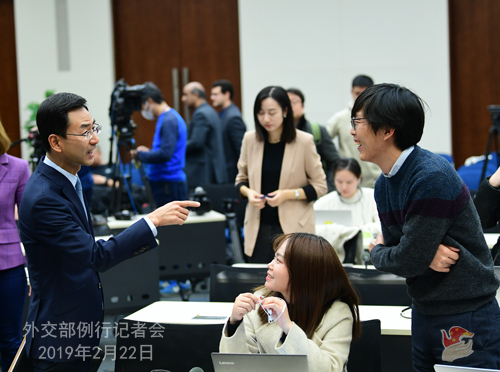 Follow-up: Did he meet with Vice Premier Han Zheng? A: Vice Premier Han Zheng met with Crown Prince Mohammed this morning. They co-chaired the third meeting of the China-Saudi Arabia High-Level Joint Committee. We will release relevant information in a timely manner.